Homemade Sausage Rolls are a British dietary staple and convenience food that are usually enjoyed as a snack, in miniature form for buffet and party food, or served as a meal with fresh peas and chips. 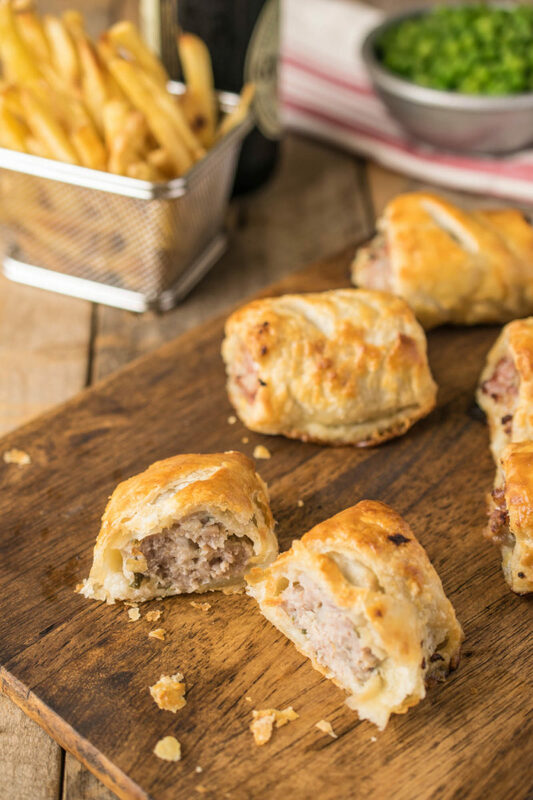 The great British sausage roll is the most popular grab-and-go foods in the U.K. Sold by every pastry shop on every high street and when you get the right flaky pastry with the most delicious pork filling, there’s nothing like it. Flaky, crispy pastry and good pork sausages are the key to really good sausage rolls. As well as being an on-the-go meal or snack, they are also so served as a meal with the standard British sides of fresh or mushy peas (recipe below) and chips (French fries). 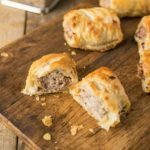 There are a few things involved in achieving the best sausage rolls and I’m going to tell you how to make sausage rolls from scratch. Any good sausage roll starts with really good filling. I like to use a good pork sausage meat in place of plain ground pork because there is already a lot of flavor in the sausage meat and therefore you don’t have to add too many additional ingredients, just simply seasoned with onion and fresh sage. A great sausage roll starts with good pastry. My flaky, buttery pastry recipe is my go-to that I use for all of my baked dishes including minced beef and onion pies. 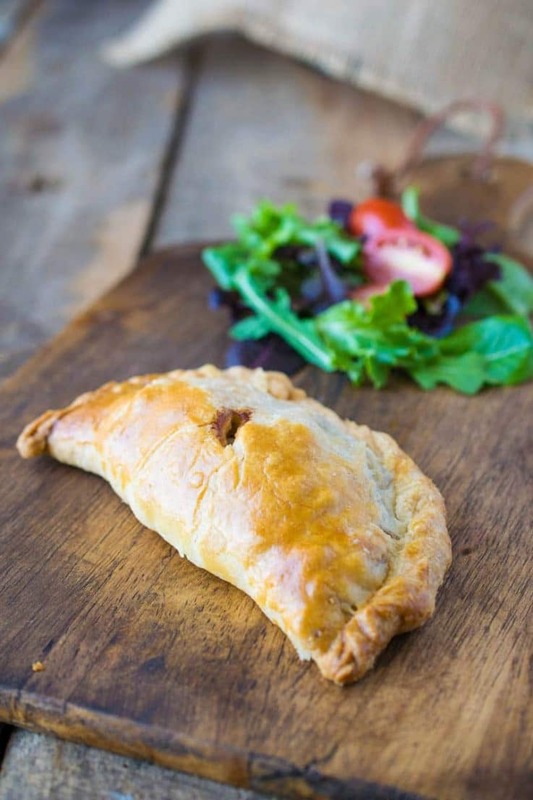 The pastry gives you the satisfying crispy texture that you come to expect with a good sausage roll and it’s the first texture you experience when you take the first bite so it’s need to be fluffy and crispy. Don’t give me a flat, deflated roll; they don’t look appetizing at all. It is called a ‘roll’ after all and not a ‘flat’. I want it standing to attention and ready to be eaten and eating these rolls, most of all give me the feeling of being back home. Sausage rolls are a great make-ahead dish because they can prepared and frozen, then baked off when you need them. Just add 10-15 minutes onto the baking time. Leftover cooked rolls freeze nicely as well and they pastry stands up nicely to warming up in the microwave, but re-heating in the oven is the best method. 435°F for 20 minutes. 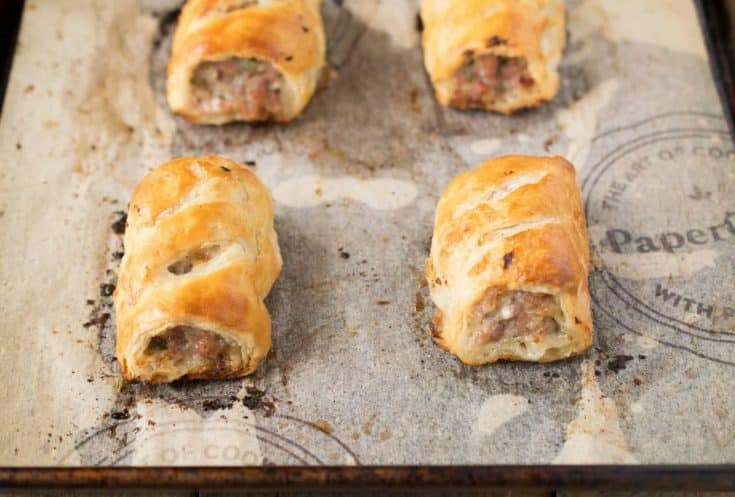 Finally, there’s one other important factor with sausage rolls, don’t forget the sauce. What sauce, you ask? There are 2 types of sauce people in England, the ketchup lovers and the HP sauce lovers. I’m a Libra; I like a good balance of both. If you’ve tried these Homemade Sausage Rolls or any other recipe on the blog then don’t forget to rate the recipe and let me know how they turned out in the comments below. I love to hear from my readers! A traditional British snack of a meaty pork filling wrapped in a flaky pastry. To a food processor, add the flour salt and butter. Pulse until the butter is broken into small balls. With the processor running, drizzle in the water until it pulls away from the sides of the bowl ( you may not need all of the water). Turn the dough out onto a floured surface. Roll the dough to a rectangle. Fold the edge furthest away from you to the center and fold the edge closest to you to the center so the edges meet. Turn 1/4 and roll out to a rectangle and fold the same way again. Mold the dough into a flat ball, wrap in plastic wrap and refrigerate for 30 minutes. While the pastry is chilling, add the sausage meat, sage and onion to a mixing bowl and mix using your hands until well blended. Refrigerate until the dough is ready. Dust a clean surface with flour and roll out the chilled pastry into a rectangle, 24 inches long and 5 inches wide. Place the meat in a sausage shape down the center of the dough. Brush beaten egg down one long side of pastry then roll the other long edge to meet the egg washed egg over the meat, making sure to seal well and that the seam is on the bottom. Cut into 8, 3-inch long rolls and place onto the baking sheet evenly apart. Brush the rolls with the egg wash and cut 2 slits into the top of the pastry taking care not to cut into the meat. Bake for 25 minutes until they are golden and crispy. These homemade sausage rolls recipe first appeared on Food Fanatic where I am a contributor. 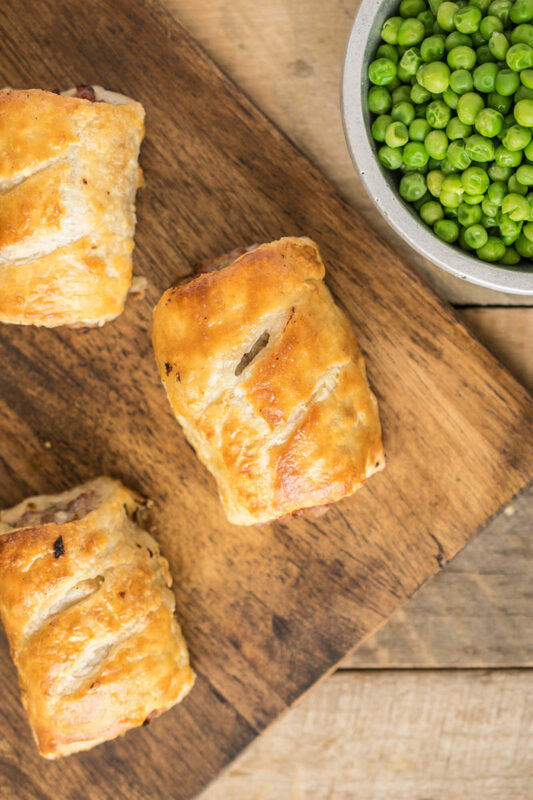 We came back from London and were craving sausage rolls so I made these and they are so good. The pastry is so flaky it reminds me of puff pastry. My grocery store sells British bangers and I used them and left out the sage. I’ll be making these again. I crave them too when I come back from England. So glad you liked them. Hi there, when reheating in the oven, what temperature and for how long? Thanks! Do you cook for the same length of time when they are frozen? Hi Shilpa, I would add 10-15 minutes onto the cooking time if baking from frozen. Thanks for visiting. I could easily try one of these, this very minute! Love savory bites. So delicious. I do love a good sausage roll, an absolute British classic. You cannot beat homemade sausage rolls and your pastry looks incredible. You can’t beat homemade, can you! These are ideal for putting in school lunch boxes.